To begin with, this is my new “cover coming soon” template for Ai Press, designed by one of the most awesome cover artists, Les Byerley. I LOVE it! Les has also designed the cover for Fallon’s Jewel but I’m waiting to unveil it until the logo – which I designed myself and couldn’t believe that I did it – is ready to be inserted onto the page. 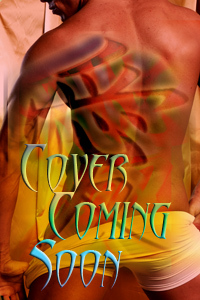 I hope you’ll check back for that cover because I can tell you now, it’s HAWT! That said, I hope to have both Fallon’s Jewel and Aki’s Love Song ready for release in April. I’m in the middle of edits now for Acts of Passion (Ellora’s Cave) and will soon be heading into edits on Fantasy Thief (Red Sage) as well as moving house. In any case, Fallon’s Jewel is with my editor now and so is in process. Of course, I’ll be annoucing each step as it happens. I’m so excited!